Got a little inspiration last night as I sat outside enjoying a Cain, glass of wild turkey 101, and golf digest. What are ya'lls favorite cigars to have out on the course? I understand many of you cant get out these days but when there isnt snow on the ground, what type of cigar do you like to smoke out there, what your favorite size on the course, and last but not least...do you take the extra effort to bend down and gently place your cigar down, drop it cuz your lazy, or do you keep puffing? I have been a fan of the Padillia Cazedores (especially for early rounds) then I will move to an Indian Tabak I like the bigger ring size and a longer smoke. I liek it to last atleast 5 or 6 holes. I gently place my stick down, it makes me quiver every time sum one just drops the cigar like its nothing. My friend once said to me, "Man you slice more balls than a butcher"
When I have a cigar, I just like to enjoy the cigar. I usually don't smoke them while doing any sort of activity (other than enjoying a beverage and company if any). It takes away from the cigar in my opinion. Kinda like commercials during a sporting event. My buddy has the tendency to hit people square in the back when he drives the ball, so I try to stay away from the golf courses. For me, golf is a time to bust out the Churchill. Anything will do, but if I have a Cohiba, that's the best. I'm a "set it down gently" guy, for the most part. I try to find a ledge on the edge of the tee box near my cart, so I don't forget it. Done that too many times to count. I'll bring a few sticks with me. I have a nice travel herfidor that holds eight churchills. Enough for everyone. Got a little inspiration last night as I sat outside enjoying a Cain, glass of wild turkey 101, and golf digest. What are ya'lls favorite cigars to have out on the course? I understand many of you cant get out these days but when there isnt snow on the ground, what type of cigar do you like to smoke out there, what your favorite size on the course, and last but not least...do you take the extra effort to bend down and gently place your cigar down, drop it cuz your lazy, or do you keep puffing? I like the bigger ring size and a longer smoke. I liek it to last atleast 5 or 6 holes. I gently place my stick down, it makes me quiver every time sum one just drops the cigar like its nothing. My go to stick on the course is an Gurkha ancient warrior or my favorite Acid Kuba Kuba I normally smoke one stick per 9 when driving I place it on the wood markers notating distance. 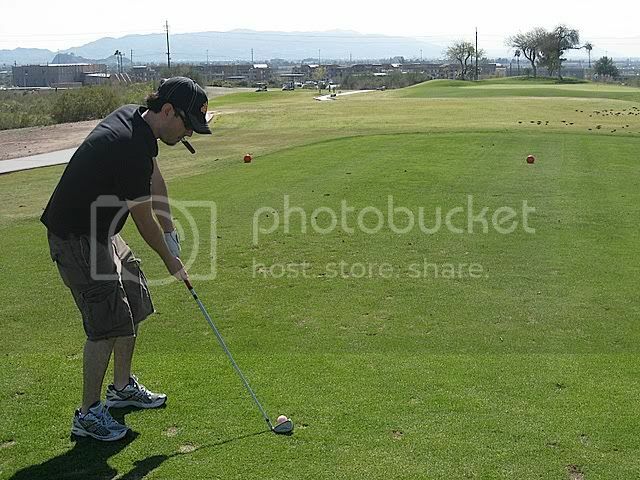 when in the fairway (or rough lol) I place the stick in font of me. when on the green I leave the stick in the cart. Depends on who I am golfing with or where I am, If Im walking my favorite Course in Ohio Im smoking a Churchill, never lay it on the ground...... People Die every year smoking the Chemicals they use to fertilize Golf Courses..... Just a Note to thoe that do that. If im with BIG DOGS I smoke What they GIVE ME! LOL Like others when I want to enjoy a smoke it s just that, I truthfully think Bragging up cigars on the golf course just makes me another SNOB in the clubhouse who thinks he with the most toys and biggest cigars wins.... I do not live that way... very happy with what I have and greatful for it! Rocky Segundos 92, one of my favorites. I take the segundos for one reason, their cheap. I usually like a churchill, something I don't have to mind too terribly much. I will be golfing this weekend and I will be taking a Reposada 96 for the front nine and an ITC 10yr. for the back 9. I like a lot of sticks but I prefer and medium or mild while golfing. Something that is not too complex. I don't need to be trying to dissect all the cigars flavors while trying to dissect my slice I sometimes set the stick down, but usually on the back of the cart. What's the weather like there, this time of year? Right on! Like to take a cheapie or a ol' reliable. I don't care what people see me smoking out there. I usually wind up in a foursome that features a guy burning Fuentes. If you like it OK, but your probably just showing off. Happy with what I have greatful for it (exactly)! Churches are the best when your golfing same reason - you don't have to pay too much attention to it. I am thinking about getting my hands on some of those ITC seconds for golfing. That course looked fantastic! I need to get to more courses around here...getting to comfy at the course I play justabout every weekend. Caiin and Turkey - that's livin'! I picked up a golf caddie for my cigar, though here in Oregon even when it's clear sky it's gusty. I always get my cigar blown out. Golf courses are a waste of a good rifle range. I like smoking Oliveros XL Bold Toros and La Vieja Habana Corojo (6x60). Both cigars are not complex but they burn well, low maintenance, and I know I enjoy every puff of flavor. I usually hold the cigar in my hand while I'm driving and I'll set it on top of the golf cart while I'm taking my shot. There's a little spot on the carts where I play that is perfect for this. I realyl like those Oliveros with a little age on em. I walk or push cart when I play so its easy to lay it on the push cart most of the time. Nothing like fresh air (the air coming thru the cigar) and golf. Gonna hit the links tomorrow as a matter of fact. I dug up this thread in honor of my first 9 holes of the year! It wasn't anything fancy, just a quick (and soggy) tour of the par 3 course near my house, but it was enough to get the fire burning! I'm all excited about this years golfing since I finally worked out that stupid slice the very last week of golfable weather last fall! I'm not a professional smoker, my experience is pretty limited, and I've only recently taken my cigars seriously enough to care what I was smoking... but I can say that I like to have something that keeps it's self lit without much fuss, will last through most of 9 holes, and isn't too strong or complex, something long lasting and simple! ...and also on the less-expensive side, given the range of tragic happenings a cigar can suffer on the golf course! Last year, before cigars and I had come into a mutual respect, I would be smoking some crap-nasty cigar from a gas station (or whatever some other concerned golfer had given me to get me to STOP smoking the crap-nasty thing from the gas station) and I would have just tossed it ash down in the cup holder or something like that... For this years golfing season however, I have purchased a neat little device similar to a clothes pin that clips to the cart and holds onto the cigar for you, even if you want to leave it there while you try to ramp the... I mean, drive 'round a bunker to the green. I guess I figure a cigar that's worth the $ and the time to smoke it is worth taking care of, right? Seriously, who wants to risk getting mud, fertilizer, insecticide or green spray paint on their stogie?? "...and in the evenings the men would be men. We would sit round the fire and share a drink, a smoke and old war stories that oft dealt more with women than war it's self. There were no fathers or sons, bosses nor hands, we were just men sitting round a fire."